Much of our life now seems very normal. I do a lot of laundry. I worry about whether Clara's nap schedule is working. I change poopy diapers. I count my lucky stars when she sleeps seven, ten, ELEVEN hours at night. We're trying a little rice cereal spoon-feeding (she doesn't get it) and she gets better and better with a bottle each day. Today, I even went to a meeting at Salem and left her with a sitter (Granted, it was "Grandma Doris," the woman who kept me when I was young while my mom worked, so I wasn't too worried, but still....). Life is, for the most part, as life would be for anyone with a four month old. Except sometimes, I still have these moments. At church on Sunday, I kept Clara in the sanctuary with us instead of putting her in the nursery (there are day-care germs in that room and it scares me a little). It was kneeling communion and I planned to just skip out, but my dad said, "Go ahead to the rails and just take her." So I did. And as I kneeled there for the first time since she was born and took the bread and drank the cup, with Clara on my shoulder, I choked up. As I drove down I-40 today and passed by Brenner Children's Hospital I thought of all the sick babies inside and all the wonderful nurses and doctors who are working tirelessly to save lives. I thought about the 78 days that we spent there and how incredibly blessed we were, and are, to have walked out of those doors with a baby in our arms. I choked up. When Clara falls asleep in my arms after nursing and her little cheeks are pressed against my skin and I can feel her (still very fast) breathing as she rests, I choke up. I watch her dad hold her and close his eyes and breathe in her smell with his face against her head and I choke up. I see her taking in her world around her, figuring things out, soaking up books, discovering her hands and feet, smiling with love when she sees people she recognizes, and I choke up. For the most part, Clara is in to holding her head UP these days. But sometimes, when she's tired, she'll rest it in that crook of my neck and shoulder and I can feel drool dripping down my back. Guess what? I choke up. This is a beautiful thing. I hope I never lose sight of each of the moments that are so sacred, so precious, so miraculous. I know I'll be choking up again next Sunday. We will have Clara dedicated at Knollwood Baptist Church during the 11:00 service. For any of you who may be interested in joining us, consider this an open invitation. This was one of the moments in the hospital that we dreamed about. I knew that we had given Clara over to God time and time again and that it wouldn't even really be necessary to say again that we're committing her to the Lord. But how sweet it will be to stand before so many people who prayed fervently for this baby and who loved and cared for us during the most difficult trial of our lives. 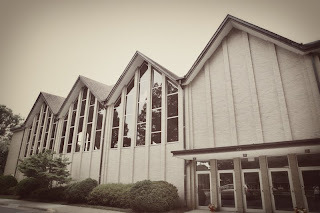 It's the same sanctuary where I was baptized, married, and ordained as a deacon. It will be another joyous rite of passage to commit Clara's [already blessed] life to God's plan. I can see it now; I'll be choking up. Grandma Doris. Thanks for watching Clara for me! Hope I do as good a job of raising her as you did of raising me! Ramsey's NICU stay, but now, I get choked up all the time. The experience changed me. I am still processing everything we went through during his CDH fight. Following other CDH blogs brings back all of the emotions as well. Ramsey is also being baptized this weekend, on Saturday and yes, I'll be choked up too! God blessed our children! I would love to attend Clara's baptism, but I'll be taking my son to college at UNCW next weekend. This is my son who was born at 35 weeks after my water broke at 24.5 weeks, my son who stayed in ICU at Duke for 4 weeks on a jet ventilator because he couldn't breathe on his own, my son who sat on my lap from age 6 mos through 4 years, receiving breathing treatments to help him breathe, my son who now runs 2 miles every day, my son who knows who Jesus is and what he did for all our sins... my son. And, yes, I still get choked up. God is good. He has been good to me. He has been good to my son. He has been good to my family (and continues to be good to us). He has been good to Clara (and will continue to be good to her). And you will continue to choke up when you think about it. Have a wonderful time on Sunday!! Oh Chrissy, this is now and forever your life--loving your child more than life itself and choking up over ALL the big and little things in their life. I remember some crazy times that choked me up but I'll have to share those with you privately!! :) Reading your blog chokes me up! Seeing the beautiful pictures of Clara choke me up! Taking Garrett to the airport yesterday after a too-quick weekend together tore me up--not just choked up--weeping all day it seemed. Friday when "baby" Harrison goes to college for the first time, I'll be BAWLING. When Davis goes back to England and my nest is truly empty for the first time...well somebody may just have to put me somewhere for a time!! We can't wait to be there for Clara's dedication and YES! I'm sure that I will get choked up!! See you Sunday! MOMS choke up .. that's just what we do. Isn't it great that GOD made us this way? Get used to it, dear Chrissy ... it is a LIFETIME thing!!!!!!!!!!!!! I certainly hope someone will be singing "Breathe on me, breath of God" at that dedication. I'm sure there will be not one dry eye in the sanctuary. Choking up as I read this blog entry! Isn't it great!